This is a beautiful rug that brightens up our kitchen. It has colors that matched our countertops and accented our cabinets. Good quality and laid flat immediately. Recommend getting rug antislip pad especially if placing on tile or wood flooring. Great value for price. Rejuvenate the style of your deck with this Boden outdoor area rug from Carson Carrington. The large, floral Moroccan pattern is machine-woven from strands of polypropylene yarns for mid-century modern style. The attractive rug is rendered in ivory, grey, and green colors, and will add head-turning appeal to your backyard. Dimensions 94.0 In. X 94.49 In. X 0.16 In. I needed a rug FAST that was big enough for my dining room, and was hesitant to order one online because I wasn't sure it would get there when I needed it. I was ordering it Monday night (around 11:30pm) and needed it before dinner on Thursday. The estimated delivery date was Thursday, so I took a chance. It arrived in time, and I was amazed at how quickly it was at my house. When I rolled out the rug, everyone in my house was in love with it immediately. It is very elegant looking and the colors are really lovely together. It is very low pile/flat woven so it was perfect for my dining room. Maybe not the cushy rug you're looking for for a living room or family room, but absolutely perfect for a place food will be frequently spilled and vacuumed up. It survived several dinners of 10 people during the holidays and still looks great. I would highly recommend this rug, particularly for a dining room. Great rugs! They add just enough color to our outdoors and feel great under our feet. 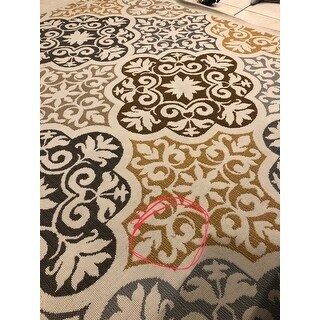 This rug looks EXACTLY like the photo and the colors a spot on. I was worried I wouldn't like it for the living room because other reviews said the material was too low pile and scratchy. It is low pile looping but I don't find it scratchy at all! We put a quarter inch thick rug pad underneath and it looks and feels great in our big living room. And the best part is its SUPER easy to clean! If you have pets, kids, or, like me, just spill/drop food often, this is the rug for you! Other reviews complained about the sides not laying flat so I rolled it out and put some boxes over the edges for just a few hours first. It worked just fine. If you're looking for a cushy, between your toes kind of carpet, then you will probably be disappointed with this purchase but if you want a beautiful patterned rug to cover your hardwood floors and liven up a room, this is an excellent choice! I ordered this rug really hoping it would be more on the indoor range of the indoor/outdoor rug range. It is not, in my opinon. I know many people have purchased this rug and loved it for an indoor rug, but for me, it was much to thin. I didn't want a big fluffy rug, but I did want something soft on my feet. This was not. If this rug was purchased as an outdoor only then I think it would be WONDERFUL! At the time I bought this there were no reviews. I am a big believer in reviews so that made me nervous. I took a chance and boy am I glad I did! The rug isn't too busy and the colors are bright enough to pop, but not overpower the room. My sofa is expresso (dark brown) so the colors of this rug worked very well. I was able to accent with the blue and gold colors. It's a very tightly woven rug so if you're looking for something super soft and plush this probably isn't for you. I was thrown by outdoor/indoor, but I assume that's the difference between super plush and not. I will say it was rather difficult to get the sides to lay flat. I put heavy boxes on the sides for over a week and that helped, but not totally. Hopefully in time this will remedy itself. Very happy I decided to purchase this rug even though it didn't have any reviews. I have since seen reviews and people were just as pleased as I was! This rug is a good fit for a summer replacement rug in my dining room. It is not plush but appears to be well made and should clean up well if there are any spills. The colors are just what I imagined. I put the no-slip rug pad underneath it. Though is does not add any extra cushion, it keeps the rug stationary. I ordered the round version and it sits well under my 60" inch round table, leaving plenty of room to sit the chairs around the perimeter of the table, comfortably. Our rug arrived very quickly, and we're very pleased with it. The colors are perfect for our living room. In regards to other reviews I read before buying this: Texture: I read several reviews that said the rug is "rough" and "scratchy". The rug is not a plush rug; the texture is similar to a berber weave rug. If you were expecting a plush rug, I can see that you would be disappointed and think it is rough. But the actual material is quite soft. I was expecting this style and was pleasantly surprised with how soft it was. I think it will be easy to vacuum and good for our pets. Doesn't lay flat at first: The rug comes tightly rolled up and wants to stay that way. Solution: we flipped the rug over upside down and put some heavy books on the corners for a day. This seems to be working quite well! Non-slip Rug Pad: We did buy the rubber mat to go under the rug. Our rug is on hardwood floors, and I would recommend the rug pad for this. The rug would slip around otherwise. If you're putting the rug on carpet, you might not need it. Overall, we are very pleased with this rug!! Great little rug for my sunroom. Colors are bright and cherry and bring the room together. It's not very think, but with a pad under it, it feels good on the feet. Ordered this indoor/outdoor rug for my indoor crafting area and it works great with spills. It is easy to clean with just water, vacuums nicely and the colors are muted enough to blend with the other colors in my home. The graphics add a nice pop against my other solid-color rugs, light oak and dark-colored furniture. It is not rough on the feet but rather soft. Would order again, if needed. Great rug, be sure to get the non-skid padding to go underneath it or it will not stay in place at all! I ordered the rug on Saturday and received it the following Thursday. 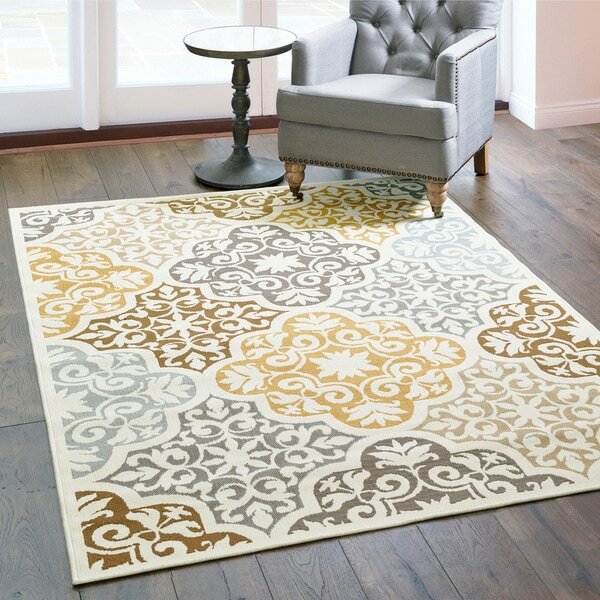 I originally ordered this rug from Home Decorators on sale, but I found it on overstock cheaper than Home Decorators sale price. Wrong cleaning description on internet. 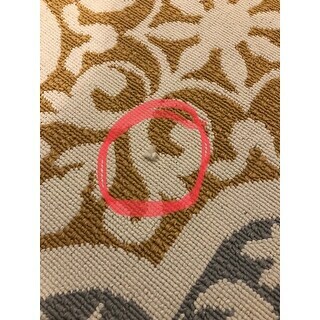 Rug was beautiful but I sent it back because the internet description said to clean it spray it with a hose and the label on the rug when it arrived said to have it professionally cleaned. I was so excited to get this rug. It is really nice and looks great under my dining room table, however the areas where it gets walked on a lot, its not holding up so well. The edges are fraying and already getting dirty. If you want it for a low traffic area, I say go for it, but if not, I would avoid. The pattern is very pretty and I loved how it looked in our space. However, the very first time I vacuumed the rug it frayed. I’m extremely disappointed in the quality and am now not only out a rug, but also have to pay $60 to ship it back. I bought this 8x10 rug for my dining room. It's a perfect fit and really looks great. My only complaint is that I am still trying to ease out the creases it came with during shipping. I've tried rolling it in the opposite direction it came in, weighing creases down with heavy objects, but they still exist. I can feel them under foot when walking on it, and the ends stick up. I'm concerned that someone will trip on it. Rug tape won't hold it down. My next move is to notify company for any other suggestions. Got this rug for my daughter and son-in-law for outdoor use. It has held well and made their outdoor look like an indoor elegant living room. Good quality Sorry I don’t have a photo to share this very moment. I put this rug under my desk in my office at work. It was a great way to cover up the old gray spotted carpet in the office and give a fresh look to the entire room. The indoor/outdoor quality of the rug makes it durable and easy to spot clean! Beautiful looks just like the picture!! This rug is gorgeous !!! Even prettier than the pics show and looks great with both browns and greys. We got rain yesterday and the raindrops were beaded on top of the rug and never soaked it. Love this purchase !!! Quality is not as good as other rugs I’ve gotten from O but it serves the purpose. Product was exactly as portrayed; beautiful bright colors. It shipped right away and was double wrapped; first in plastic, then in a box - very impressed. Rug was in perfect condition and only took 2 days for it to lay flat. Highly recommend buying rugs from Overstock.com. Like the colors. Edges are starting to fray a little after about a year. But still pleased. The colors are vibrant and the pattern is beautiful. Love it! "Has anyone used this on a wood composite deck without a roof? Just want to make sure it won’t harm the decking. Thanks!" I purchased this rug last summer for my Trek deck. It looked great, unfortunately, we had a very rainy summer and it got moldy in spots. However, it did not ruin my deck. "I just purchased this for outside our RV. Does it roll/store easily?" Yes, I've rolled it up when a thunderstorm was predicted and i wanted to save it from getting real wet. It is a large one but I could roll it and lift it to keep it safe and dry. "Can you wash this with a hose? Or can it not get wet?" I use my rug in my dining room, so i havent gotten it wet. I wouldnt think spraying it with a hose would clean it well, although i think it would dry out eventually. I wash mine all the time with a hose and spray nozzle to get the white clean again. It dries quickly if left in sun. I even had it out during winter and it still looks great. "What is the name of the furniture featured in the photos?" "Can this rug be left outside, or will I need to bring it in should it rain?" This rug can be left outdoors. I didn't intend to, but l left mine outside this entire exceptionally rainy Pacific Northwest winter. It was pretty dirty but in good shape. I power washed it and it looks fine now. I will bring it indoors next winter, though, just to save the work of deep cleaning. "I wanted the 1'9" by 3'11" will that be available?" Hello Katrina D., items are restocked as they become available; however, we cannot guarantee an item will be restocked. Thank you for shopping with us. "How much would it cost to return the 6x9 rug if I don't like it?" Hello ksawyer94, we are unable to do return estimates on products until the return has been initiated. Thanks for shopping with us!